>> We Have This Moment Today! We Have This Moment Today! Listed below are some wonderful ways to make family memories. There are ideas for different occasions throughout the year including Christmas. It is never too late to start making your own memories. . When you come to the end and you have thought of another idea that you use with your family, how about leaving a comment and sharing it. I would love to hear from you. New Year’s champ – While waiting for midnight, choose a family game that all can play. Record the winner for the coming year in the lid of the box. Over the years it will be fun to see who reigned as the New Year’s “champ” from year to year.” Family Diary – Begin a “family diary” on the first day of the year. take turns writing about events and activities that occur on each day or week throughout the year. At the end of the year, schedule an evening to review and discuss the happenings of the previous twelve months. Family Fun Night – During the first week of the New year, decorate a coffee can and label it “Family Fun Throughout the Year.” Have each family member write five family activities which he or she would like to do on “Family Fun” night. then drop the slips of paper in the container. Each week draw one activity from the can. Love Notes – Write notes of “love” to each member of your family. Tell them why you love and appreciate them. Be specific! Personalized Fortune Cookies – Buy a bag of Chinese fortune cookies. Carefully pull the fortunes out from the cookies with a pair of tweezers. Cut up small slips of paper and write your own messages of love either in one sentence or on several pieces of paper that must be fitted together like a puzzle. Happy Birthday America Cake – let the children help bake and decorate a cake with the appropriate shape or design. sing “Happy Birthday, America”, then cut the cake and enjoy. Serve red punch with blue ice cubes tinted with food coloring. My Family’s work Heritage – Make a game finding out what your ancestors did for their life’s work. Thank God for the wide opportunity for work available to us today. Thank Him for each person’s specialness and the chance to express that uniqueness in the work we do. “Thank you” Place Cards – Fold unlined 3×5 cards in half to make place cards for every person at the Thanksgiving table. Decorate the cards in a Thanksgiving theme withe each person’s name on the front of a card. On the inside, write a personal thank-you message. Make each message personal, truthful, and specific. Larger cards may be used if desired so each member of the family can write a message to every other person having dinner – all on the same card. Jesus’ Birthday Party – Have a birthday party in honor of Him whose birth we celebrate. Include in the celebration an older person who would otherwise be alone, a young person away from home, andone or two special friends such as a pstor or teacher who is important to your family’s life. Children’s Christmas Tree – Give younger children their own “tree” – a small artificial fir which they decorate with lights and their own ornaments. Candlelight Christmas Eve – After reading the Christmas story on Christmas Eve, lower the lights and give each family member a votive candle. As each person lights his candle, he shares one blessing he is especially thankful for during the past year, and something he or she is asking God to do in his life the following year – perhaps a spiritual goal for the coming year. Cranberries at Dinner – Before Christmas dinner, put two fresh cranberries on each plate. After the family is seated, pass around a basket and, as cranberries are dropped in, share two ways in which Christmas is special to you. Letters of Thanks – Have children write or color a letter of thanks to Jesus for the many gifts that He has given them. Christmas Service – Have children conduct a service Christmas morning for the family. They can sing, do a play, or the boys can even “preach”. 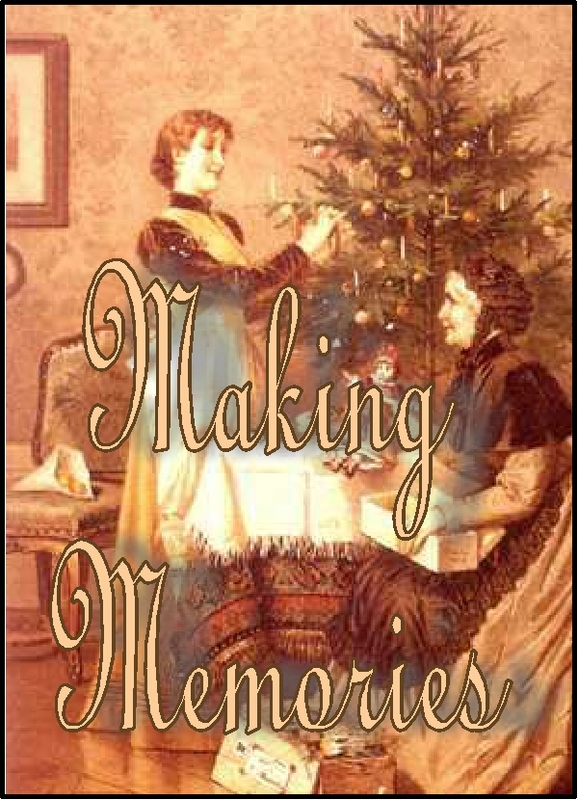 Family Memories – Take some time each holiday to view all the family photographs and movies. It is fun to see how everyone has changed, and it stirs warm memories to reminisce about when the pictures were taken. After Christmas Cards – After Christmas is over and the household is more settled, place the cards from that year in an attractive container. After dinner each evening, pass the container and let each member of the family choose one card. Take turns reading the cards and enjoying their beauty. Discuss the family or person who sent the card. Pray for each individually. You can even send a postcard to each, letting them know you prayed for them that day. Memory Table Cloth – Using a cloth table cloth have each family member, relative, friend, or whoever is present during this time of year draw something on the cloth along with their name and date. Later the cloth can be liquid embroidered or cross stitched or whatever suits you. Briing the cloth out each year and have each person once again draw something new. What fun to use that table cloth over and over each year! This project can be used for most any holiday or birthday. Just use your imagination. Happy “Half” Birthday – On each child’s “half” birthday, have a half celebration. Bake a “half” cake and serve a half glass of punch. Annual Birthday Interview – On each child’s birthday, record on cassette tape or video an interview with him or her. ask him or her to describe special memories about the past year – happy times, sad moments, fun things that happened, and other meaningful experiences. Add to the recording every year. After each interview, play back the previous years conversations. A Starry Welcome – Before leaving your present home, spend time as a family outside at night. Look for familiar constellations, watch the moon rise, etc. After arriving at your new home leave all the boxed and unpacking for a few minutes each night during the first week. Sit quietly out in your new front yard or on the porch or balcony. Try to find each familiar constellatin and talk about the comfort you find in knowing the same sky and heavenly father are there with you too. Treasure Hunt – while everyone is busy unloading, hide small surprised or treats around the nooks and crannies of the new house and yard. At a time when everyone need a break gived each ot the children a small sack and send them out to find the treasures. When everyone returns, share the treats and a cool glass of lemonade. A Living Welcome – Make a family project of planting a new tree that will grow as you take root in this new home. As you see the tree grow it is a visual reminder of the time you have spent in this new place that is now home. This may also be sued when a new baby is born. Be sure to take pictures of the little seeding for later generations to see. Remembrance – When someone in your family accepts Christ commemorate the occasion by giving them a special object. Place it in a prominent place and date the object with a waterproof pen. Each year on the anniversary of the date, bring attention to that important decision. Play Together – use your children as a wonderful excuse to play! Kids talk when they play, and they don’t have to get your attention if they already have it! Honor Plate – Choose an unusual or especially attractive plate to be used only on a special occasion. Serve a meal on that plate when a member of the family is to be honored, such as on Father’s Day Mother’s Day, a birthday, after receiving a good report card or an award, or after a difficult job is finished, etc. Puzzle Place – When things are rushed or hectic or when there are a lot of guests in and out, set out a huge 500 piece puzzle on the coffee table or game table. Watch how many good conversations are precipitated by this simple-to-share task. Summer Memory Book – Start at the beginning of summer, record dates of special outings, family activities, unusual events, etc. Place souvenirs in the notebook. Record the height and weight of each member of the family. At the end of the season look back on the memories you have created. My Special Dinner – Once a month, have each child prepare the evening menu for the family. Let the child help you shop for the groceries and help prepare the food and design special table decorations. Suggest that it will be fun to keep the menu a secret from the rest for the family until dinnertime. Most of these ideas were taken from “Let’s Make a Memory” by Gloria Gaither and Shirley Dobson, a good book to have in your library. Would you leave a comment and share a way to make a special memory?